Family-owned and -operated since 1993, Family Auto Clinic has a reputation for superior customer service and high-quality work, done at affordable prices. 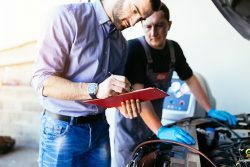 Our team of skilled technicians specializes in state safety inspections, auto HVAC, auto electrical, belts and hoses, engine work, factory-scheduled maintenance and more. Stop by and see us today! For best-in-class auto repair in Hyattsville, MD—no matter what type of vehicle you’re driving—make Family Auto Clinic your first and only destination for service. We’re the area’s foremost mechanic and can provide your vehicle with a full scope of repairs and routine maintenance, no matter what it needs to stay functional. We want to be the place where you get your oil change and your tires rotated, as well as your first call for emergency service and towing. We promise you’ll always get a superior level of service from us, with prices that are affordable and honest. Our goal is to be the number one auto shop in Hyattsville, MD! Our business has been family-owned and –operated since 1993! We’re a Federated Car Care Center and Pronto Car Care Center. Our shop is authorized for Maryland State Vehicle Inspections. We strive to offer same-day service for your vehicle whenever possible. When your car needs service or scheduled maintenance, waste no time in contact Family Auto Clinic. We’re here to provide the services your vehicle needs to stay safe and functional.